Curie was the first single person in history to win two Nobel Prizes in two different specialties. She received a degree in Physics and Mathematics from the Sorbonne in Paris, where she met physics professor Pierre Curie, whom she would finally marry. Together, Marie and Pierre developed a great part of their research, focused on radioactivity. Impressed by Henri Becquerel’s discovery of the unknown nature rays transmitted by uranium salts, Marie wanted to know what that radiance was and why it happened. Marie Salomena Skłodowska Curie was born in Warsaw (Poland) on November 7th, 1867 and died in Passy (France) on November 4th, 1934. Her parents were the Physics and Mathematics teacher Władysław Skłodowski and the teacher Bronisława Boguska. Curie was the youngest member of a big family that went through big economic and political ups and downs. Nevertheless, little Marie always showed her desire to study even though she could not enter a higher education institution because she was a woman. Together with her sister, she was forced to study at a Polish clandestine university that allowed women, while she was working as a governess. Finally, she could move to France where she continued her studies on Physics, Chemistry and Mathematics at the Sorbonne, which at that time, there were only 27 women among its 700 students. 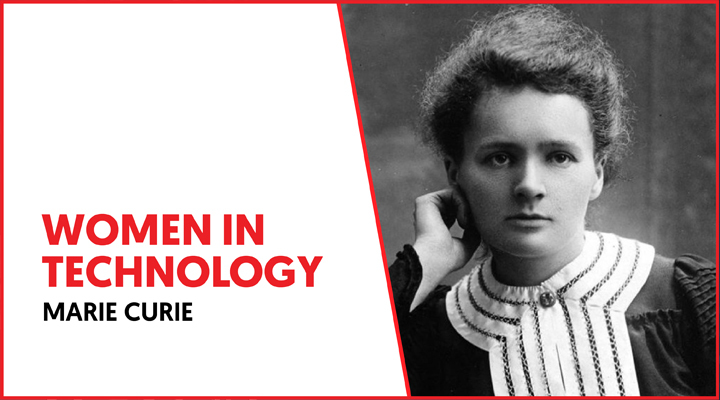 Years later, on November 15th, 1906, Marie Curie gave her first physics class at the same university. According to legend, the Curie marriage worked together in a small, dark shed until it came up with two highly radioactive elements not recognized to date: polonium and radio. Their research into radioactivity prompted Curie to become the first woman to receive a Nobel Prize in Physics, jointly with her husband Pierre and professor Becquerel. In 1906, Pierre Curie dies when he was run over by a carriage so Marie had to continue her work by herself. She combined her job as a university professor, her work as a researcher and the care of her daughters. Curie discovered that radiotherapy could be an effective treatment against cancer. In recognition of this research, in 1911 she won her second Nobel Prize, this time in the Chemistry discipline. In addition to her work as a scientist, she created the first radiological centres for military use during the World War I. Curie purchased several automobiles and portable X-ray machines to set up a kind of radiological ambulance. As a result, many soldiers were saved and she became Director of the French Red Cross Radiology Service. Years after her involvement in health care at war times, Marie Curie founded the ‘Institute Curie’ in Paris and Warsaw, the cities that had the most influence on her. Today, these institutes remain Europe’s leading medical research centres.